Gathered Valance (Pelmet) is excellent to cover the space visible at the track. Perfect for use over any curtain or drapery for cabin portholes, or public areas. They will add style and enhance appearance. 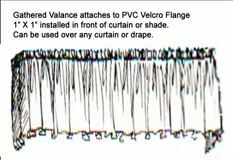 Gathered Valances (Pelmets) are either self-lined, or blackout lined. Attaches to 1” x 1” (2.5cm) Velcro PVC flange (white or black) for easy installation and removal. All materials are F/R & washable.